This looks fascinating! 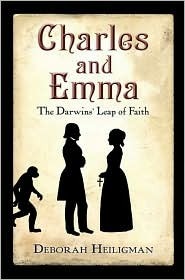 Charles Darwin has always intrigued me but I can't say I've ever known too much about his personal life. I love hearing about stories where love conquers any sort of religious or cultural differences so this really looks like an incredible read in that aspect as well! I think it is strange that the book is so long when it is intended for ya readers--being that it is in fact non-fiction. Does it read like fiction though? Also, thanks Man of la Books! Hmm this actually sounds interesting! I really like the cover, simple yet telling and creative..